Abel Willmarth was born perhaps about 1735. 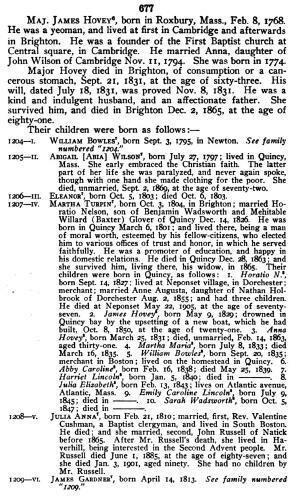 "Massachusetts Births and Christenings, 1639-1915," database, FamilySearch (https://familysearch.org/ark:/61903/1:1:FC7V-J5X : 4 December 2014), Abel Willmarth, 12 Feb 1759; citing REHOBOTH,BRISTOL,MASSACHUSETTS, ; FHL microfilm 908,952. Abigail Wilson was born perhaps about 1786. 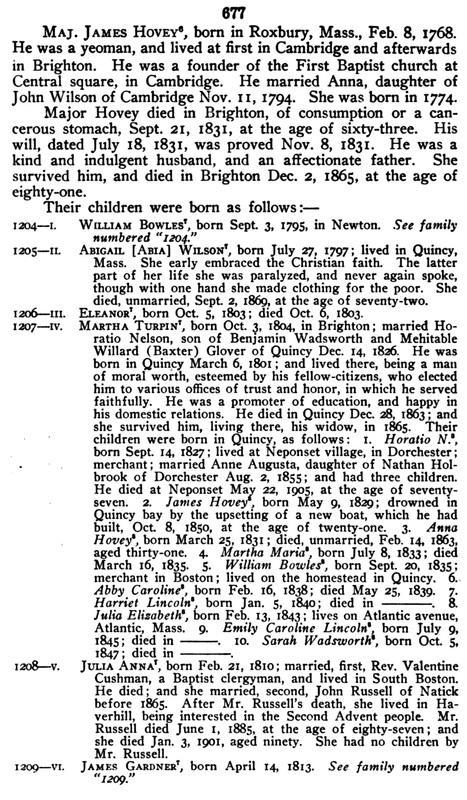 Clarence A. Torry, New England Marriages Prior to 1700, Baltimore, MD: Genealogical Publishing Co., (2004) , p. 825. Caleb Wilson was born perhaps about 1784. Daniel Wilson was born perhaps about 1782. David Wilson was born perhaps about 1790. Edward Wilson was born perhaps about 1780. Roxbury (Mass. ), Vital records of Roxbury, Massachusetts, to the end of the year 1849, Salem, Mass. : Essex Institute, (1925) , p. 386. 1790 United States. Census Office. 1st census, Census schedules, 1790, Washington [District of Columbia]: The National Archives, (1969) , p. 205. 1800 United States. Census Office. 2nd census, Census schedules, 1800, Washington [District of Columbia]: National Archives. Central Plains Region,, (1949, 1958-1960) , refer to census page 110. Roxbury (Mass. ), , p. 673, from church record of First Congregational Parish of West Roxbury (Unitarian). Hannah Wilson was born perhaps about 1788. Mary Wilson was born perhaps about 1712. "Massachusetts, Town Clerk, Vital and Town Records, 1626-2001," database with images, FamilySearch (https://familysearch.org/ark:/61903/1:1:FHZ9-N6X : 13 July 2016), Joseph Gardner and Mary Wilson, 11 May 1732; citing Marriage, Roxbury, Suffolk, Massachusetts, United States, , town clerk offices, Massachusetts; FHL microfilm 741,320. "Massachusetts, Town Clerk, Vital and Town Records, 1626-2001," database with images, FamilySearch (https://familysearch.org/ark:/61903/1:1:F4LP-X9K : 13 July 2016), Joseph Gardner, 08 Aug 1734; citing Birth, Roxbury, Suffolk, Massachusetts, United States, , town clerk offices, Massachusetts; FHL microfilm 741,320. Thomas W. Baldwin, Vital Records of Cambridge, Massachusetts, to the year 1850, Boston: Wright & Potter Print. Co., (1914) , Vol. 2, p. 208. Lived in South Pasadena, CA from 1985. Pam Abbott is online at https://www.facebook.com/pam.abbott.50. 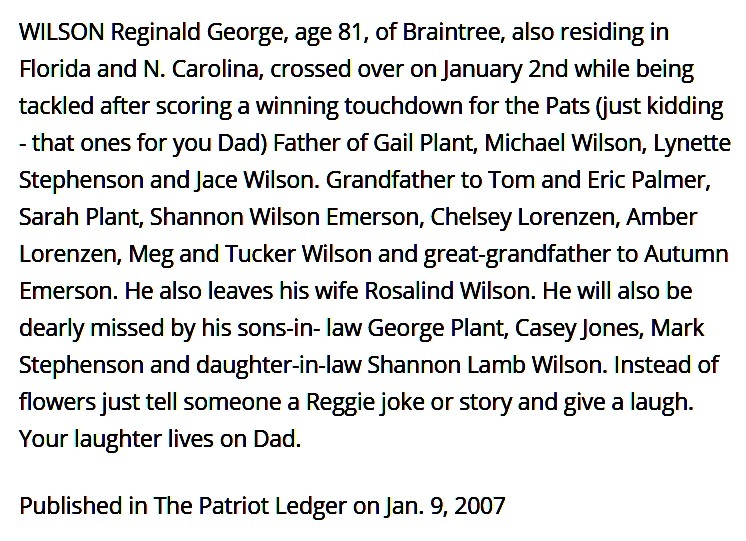 Reginald George Wilson was born on February 17, 1925 in Spring Hill, Cumberland County, Nova Scotia, Canada. [gender unknown] Wilson was born perhaps about 1793. 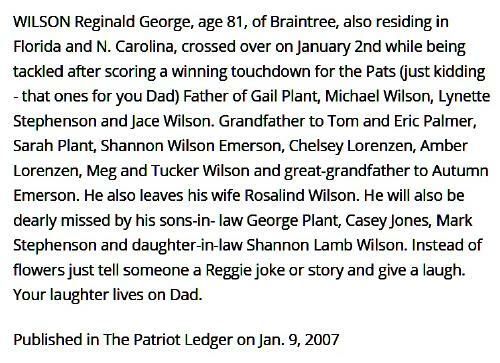 Massachusetts Vital Records, 1841-1910, , Vol: 303 ; Page: 201. "United States Public Records, 1970-2009," database, FamilySearch (https://familysearch.org/ark:/61903/1:1:QJ1Z-RLKZ : 16 May 2014), Ann Marie Winch, Residence, Maitland, Florida, United States; a third party aggregator of publicly available information.